[Dave] used to grow chili peppers, but after moving to Texas he noticed his plants were drying up and dying off. This is understandable; Texas is freaking hot compared to his old home in the UK. These chilis needed a watering system, and with a pump, relay module, and an MSP430 launchpad, it was pretty easy to put together. The core of the build is an MSP430 launchpad, a Sharp Memory LCD BoosterPack for the user interface, and a few bits and bobs for pumping water from a large soda bottle to the plant. Before beginning his build, [Dave] took a look at commercial watering systems, but could only find huge irrigation systems for greenhouses or gardens. This was obviously overkill, but with a few parts – a six volt pump and a relay control board – [Dave] was able to make a simple system that keeps chilis watered for seven days between refilling the reservoir. With a name like that how could we possibly pass up featuring this one? Truly a hack, this pancake making robot was built in under 24 hours. [Carter Hurd], [Ryan Niemo], and [David Frank] won the 2015 Ohio State University Makethon with the project. The gantry runs on drawer sliders using belts from a RepRap. The motors themselves are DC with encoders. [Carter] tells us that since most 3D Printers are build on stepper motors this meant they had to scratch-build the control software but luckily were able to reuse PID software for the rest. Get this, the pump driving the pancake batter was pulled from a Keurig and a servo motor is used to kink the tubing, halting the flow. We are amused by the use of a Sriracha bottle as the nozzle. It wasn’t just the printer being hacked together. The team also built an iPhone app that lets you draw your desired pattern and push it to the machine via WiFi. Inspired yet? We are! If you’re anywhere near New York City you need to bring this kind of game to our Hackathon on May 2-3. One night, lots of fun, lots of food, and plenty of hardware. What can you accomplish? Are satellites fake? Nobody knows, because no one has done an experiment to determine if rocket engines will produce thrust in a vacuum. At least that’s what this Kickstarter says, and it’s asking for $100 to test multiple types of rocket engines in an enclosed, evacuated chamber. Anyone who has thought about this problem for half a second will tell you yes, rocket engines will work in a vacuum. It’s an application of Newton’s Third Law of Motion; if you explode fuel and dump it out the back of a rocket, the rocket will go forward. Rocket engines don’t push against air. Strap in, because this one gets better. In a video linked to from the Kickstarter Campaign, satellites do not exist. This is because gas molecules in the thermosphere can reach 2,500 °C, hot enough to melt the metal satellites are made of. Never mind that the 2,500 °C figure is only for individual gas molecules; the atmosphere at these altitudes is so rarefied, there isn’t much contact with matter. Oh, second point: have you ever realized that a Google image search of the word ‘satellite’ mostly shows illustrations and renders? It’s not because to take a picture of a satellite in orbit would require two satellites flying in formation; no, it must be because satellites don’t exist. It gets better from there. Thirty years ago there was a lot of unused spectrum in the 900MHz, 2.4GHz, and 5.2GHz bands. They were licensed for industrial, scientific, and medical uses since their establishment in 1947. But by the 1980s, these bands were identified as being underused. Spectrum is a valuable resource, and in 1985, the FCC first allowed unlicensed, spread spectrum use of these bands. Anyone who has ever configured a router will know the importance of this slice of spectrum: they’re the backbone of WiFi and 4G. If you’re not connected to the Internet through an Ethernet cable, you have the FCC Commissioners and chairpersons in 1985 to thank for that. Last week, the FCC unanimously voted to allow the use of spectrum in the 3.5GHz band with the Citizens Broadband Radio Service. This opens up 150 MHz of spectrum from 3550 – 3700MHz for new wireless broadband services. If history repeats itself, you will be connecting to the Internet with the Citizens Broadband Radio Service (CBRS) in a few years. Access to the 3.5GHz spectrum will be divided into three levels. The highest tier, incumbent access, will be reserved for the institutions already using it – military radars and aeronautical radio. The second tier, priority access, will be auctioned and licensed by the FCC for broadband providers via Priority Access Licenses (PALs). The final tier, general authorized access, will be available for you and me, provided the spectrum isn’t already allocated to higher tiers. This is an unprecedented development in spectrum allocation and an experiment to see if this type of spectrum allocation leads to more utilization. There are, however, unanswered questions. Commissioner [O’Rielly] has said the three-year license with no renewable expectancy could limit commercial uptake of PALs. Some commentors have claimed the protocols necessary for the CBRS to coexist with WiFi devices does not exist. Still, the drumbeat demanding more and more spectrum marches on, and 2/3rds of the 150MHz made available under this order was previously locked up for the exclusive use of the Defense Department. Sharing spectrum between various users is the future, and in this case has the nice bonus of creating a free citizens band radio service. You can read the full order here, or watch the stream of the April 17th meeting. We’ve been riding the runaway train that is Hackaday.io for about fourteen months. With over 60k registered user and hundreds of thousands of visitors a month it’s hard to remember how we got from humble beginnings to where we stand now. But a big part of this is all the suggestions we’ve been hearing from you. On the top of that list have been numerous requests for more collaborative features. This week we’ve pushed an update that will change the way you interact with your fellow hackers. This brand new messaging interface is beyond what we dreamed when we started development. Our goal with Hackaday has long been to form the Virtual Hackerspace, and this is it. 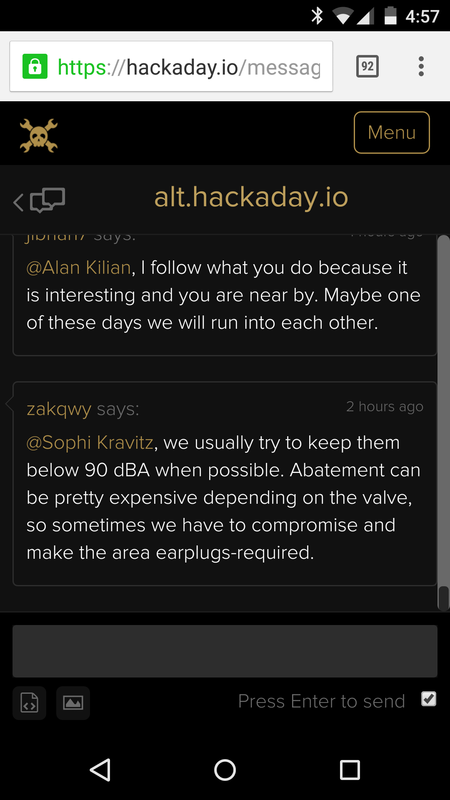 Shown above is group messaging for the alt.hackaday.io project. You can see that thread selected on the left among many other threads in progress. On the right is the list of the team collaborators. 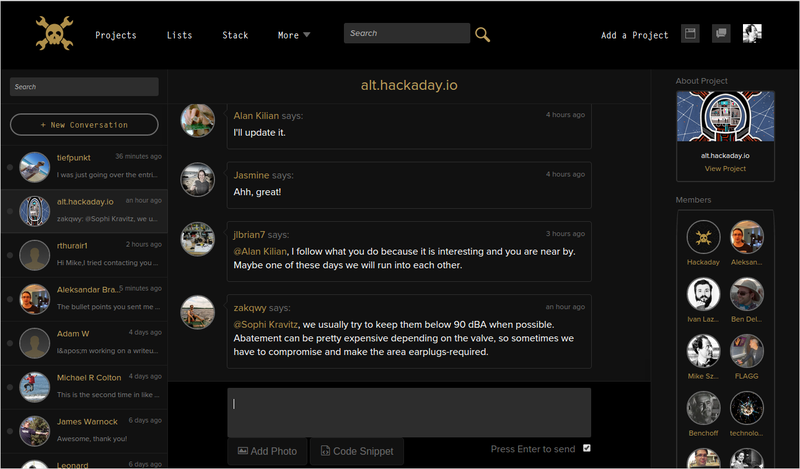 Each project on Hackaday.io has group messaging availalbe, all you need to do is add your collaborators. Need skills that you don’t have to finish the project? Just want to brainstorm the next big project? Jump on Hackaday.io and get into it. Head over to one of your projects, invite some collaborators if you don’t already have them, and click the “Group Messaging” button in the left column. This is not private messaging and it’s not just chat. This is new. It’s persistent, it’s instant, it’s long, it’s short, it is what you need to work with other hackers. We don’t even know what to call it yet. You can help with that and you can tell us what you find to do with it. We’ve designed it for creative abuse. When loading up the message page for the first time you’ll see a bar across the top requesting desktop notification access. This feature gives you a pop-up message when the tab with the messaging interface is not active. If you don’t have the interface open you will receive an email when new messages come in. This can be toggled globally for all of your chats but we do have plans to configure these emails per-chat thread. Thanks to [jlbrian7] for the tip that users of Firefox on Linux need an extension to enable notifications. I’m using Chrome on Mint and it work just fine without adding packages. This Virtual Hackerspace goes with you and we’re not just talking out of the house. How many times have you been sitting at the bench wondering what the heck you’re doing wrong? Whip out your phone, snap a picture and post it so the collaborators on your team can help out. Right now it’s rock-solid on iPhone. Android requires a very quick double-tap on the image icon to trigger but we’ll have that fixed in a jiffy. Of course images work from the computer interface as well, and there’s a code tool to embed snippets in your messages. The only part we don’t have working is the ability to talk to yourself but that is coming. For now you must have collaborators to enable group messaging and this update makes that simple. Each project has a team list in the left hand column. You’ll notice that a text box has been added to invite members. Just type their hacker name and click the invite button. They’ll get a private message with instructions for accepting your invitation. We’ve set up the official Hackaday Prize Hacker Channel so that you can try it out right away. Casual conversation is welcome, but this is also a great opportunity to find team members for your Hackaday Prize entry. We’ll also be hosting regular events on the channel. More on that soon! The Vintage Computer Festival East was last weekend, and now it’s time to wrap everything up. We’re going to start this off with a video of the biggest, most intolerable jerk on the planet walking around the boardwalk at Ashbury Park. Thanks to [Fran] for filming it. That video, despite the wretched casting director, included the reveal of the PDP Straight-8, the 50-year-old minicomputer that was repaired and refurbished by [David Gesswein] just this year. You can see some pictures of that and more below, and a little more on [David]’s website.